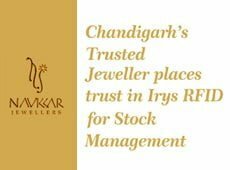 Over the last decade and a half, Navkkar Jewellers has grown consistently to established itself as one of the leading & most trusted Jewellery brands in Chandigarh and much of this success is attributed to the dynamic Leadership – initially by Lt. Col. K.C. Jain and now by his son, Mr. Vivek Jain. Be it the jewellery designs on offer or the systems running in the background, Navkkar has always invested in the best and the results are quite visible. With this same approach, Mr. Vivek started exploring RFID a year and a half ago – primary goal being increase in efficiency of daily stock taking and overall improvement of stock visibility and. Irys emerged as the clear winner in the evaluation process and has lived up to the expectations of the entire staff at Navkkar.